Is your dog a heavy chewer? Does your dogs chew through toys in a matter of days? If this sounds like your canine companion, keep reading for a list of durable dog toys for heavy chewers. 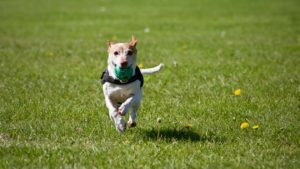 When choosing toys for your dog, it is important to choose toys that will keep him engaged and active. You should also choose dog toys that have high ratings for safety and durability. Remember to choose toys that are specially designed for dogs; children’s toys and even cat toys are a no-go for a dog. We’ve put together a list of the best indestructible dog toys in 2018, to help you narrow down your choices in the toy section at your favorite pet store. A Kong toy filled with peanut butter or other small treats is a great toy to keep your dog engaged and his mind active. This type of toy also teaches him skills that are important in other areas of his doggie life. A Kong itself is made of molded rubber and is shaped in a way that prohibits most dogs from biting off tiny pieces. Just remember to supervise your pup when he is playing with a Kong; some dogs can get excited and choke on the treats inside the Kong. The KONG Extreme dog toy has the traditional time-tested design. It is light weight, and made off all-natural and very durable rubber. It has a snowman like shape and has a small hole at the bottom to hold tasty treats, like Fido’s NuVet supplements. KONG Tires are exactly what the sound like. A tire shaped dog toy made out of all-natural and durable rubber. This version of the KONG can give your dog a few more options on how to hold it or play with it. It also allows the pet parent to put peanut butter on the interior of the tire for Fido to enjoy. For tug of war enthusiasts, there is KONG Tugga Wubba. Unlike the previously mentioned KONG dog toys, this toy is made with reinforced nylon and tails on both ends. It is a durable option for an interactive tug toy and comes in a variety of sizes and colors. This tough dog bone is not only durable, but it is water safe! It can be easily seen due to it’s bright colors and is light enough to float in water. The West Paw dog bone believes in it’s products durability and offers a limited lifetime warranty. For pet parents who are germ conscious, this indestructible dog toy may be the perfect option. It is made of non-toxic materials, FDA-compliant, and easy to clean. To sanitize the tough dog bone, just put it on the top shelf of your dishwater and let it go through a cycle. Did you know that there are puzzles made just for dogs? Many pet stores carry these toys now, or you can find a lot of great options online. When you help your dog work a doggy puzzle, it teaches him recognition and memory skills. Plus, it gives you an opportunity to bond. Most of these puzzles are made of tough rubber or even molded plastic, so they are basically indestructible. If your dog is insistent on having a plush toy, go for the goDog Gators Chew Guard dog toy. It is made with a strong and durable liner and double stitched to withstand chewing. Although plush toys are not ideal for a heavy chewer, this is one of the more durable plush toys currently available. If you prefer to stick with the classics, consider a tennis ball. Tennis balls are one of the most popular dog toys around; these balls come in several sizes to meet the needs of most dogs. Due to their round size and solid composition, they are nearly impossible to chew up or destroy. Plus, they are easy to find, so you can pick up a can of tennis balls whenever you hit the store. The frisbee is another old stand-by. Frisbees are fun for you and your dog, and many pet parents can throw a frisbee further than they can toss other types of toys. Plus, the large surface area of a frisbee makes it easy for your pooch to catch on the run. This gives your dog exercise, and is a great way to wear him out so he sleeps well at night. Best of all, it takes years of wear and tear and bite marks to destroy a frisbee, so this inexpensive toy is a great option. Most dogs love squeaky toys, but a lot of toys with just one or two squeakers can be destroyed in seconds by a large or determined dog. Ky-Jen has a great line of squeaker mat toys in cute shapes like alligators and cows. These toys have 12 to 30 squeakers and are nearly indestructible. Plus, they are big enough for your dog to share his toy with another dog or even with you. While toys and treats keep your dog happy and engaged, a good diet is also a must. A high-quality dog food is important; grain-free varieties are best. A high-quality supplement is also imperative for a happy and healthy canine. Choose one that is made with human-grade ingredients for best results. NuVet Plus is specially formulated with high-quality, human-grade ingredients, and is made to meet the nutritional needs of almost every dog. For more information, visit our website where you can place an order for the right supplements for your dog.